Mauritius is an island of about 1 million inhabitants situated in the Indian Ocean. The ethnic diversity of the local people is reflected in its cuisine. As a result, the cuisine of Mauritius is a blend of Indian Cuisine, Creole, Chinese and European. In Mauritius, local fruits and vegetables used under the influence of culinary traditions of France, India, China and Africa with its variety of flavours and aromas have resulted in a cuisine that is unique to the island. The most commonly served in Mauritius, and tasty dishes include Creole rougailles, Indian curries and biryanis, Chinese “mine frite”, and French “gratin de crabes sur coeur de palmiste”. All these are part of the cuisine of Mauritius. The commonly used ingredients in Mauritius are tomatoes, onions, ginger, garlic and chillies while the traditional base is definitely the curries and “rougailles” which is made from the blends of home crushed spices. Spices also constitute a major part of Mauritian cuisine. The extensive use of spices such as saffron, cinnamon, cardamom, and cloves provide a powerful, yet subtle flavour to the dish. This interblending of spices give the cuisine of Mauritius its charm and uniqueness. Over the years, the communities have blended each others’ spices and ingredients to their own tasted resulting in a tasty mixture sure to flatter the senses. For example, a Creole rougaille is best served with a variety of achards (pickles), a Chinese “mine frite” (noodles) is often served with various “chatini” (chutneys). And although I have never had Mauritius Cuisine before, I can understand what exotic and finger licking blend it would create to mix the best flavours of Asian Cuisine all across. Its indeed a culture, I would love to explore. As of now, lets explore their Food.. 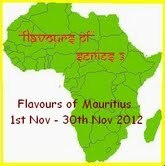 Please get your hands on some exotic Mauritius recipes and lets savor the cuisine together on this page. For your help, I have provided some links so that you could take a tour and explore the Cuisine more. Link in your Entries to the linky tool below between 1st Nov – 30th Nov. It could be both veg and non-veg, no Alcohol and Pork/beef allowed please. Any number of fresh or archived entries are permitted. Sounds interesting, look forward to learning new cuisine from your round up. Here is my entry trying to link it but its not showing on linky. Can you add it please. Hi everyone! I’m Prerrna from Mauritius. If you are looking for authentic maurtitan dishes you can find a wide range on my blog: http://inspiredtobake.wordpress.com/ will try to make something for your event before the deadline. cheers!